Set up a professional JIRA bug reporting workflow in a few simple steps. If you're building software and websites, you know that bugs are inevitable. The real challenge is to make sure that your team has an efficient way to identify, report and track bugs. JIRA is an amazing tool to keep track of bugs. However reporting them can prove cumbersome. It breaks up your workflow and it often not descriptive enough for developers to understand and reproduce bugs fast enough. That's why we created Marker.io, the best way to create detailed-rich bug reports in JIRA without leaving your website. 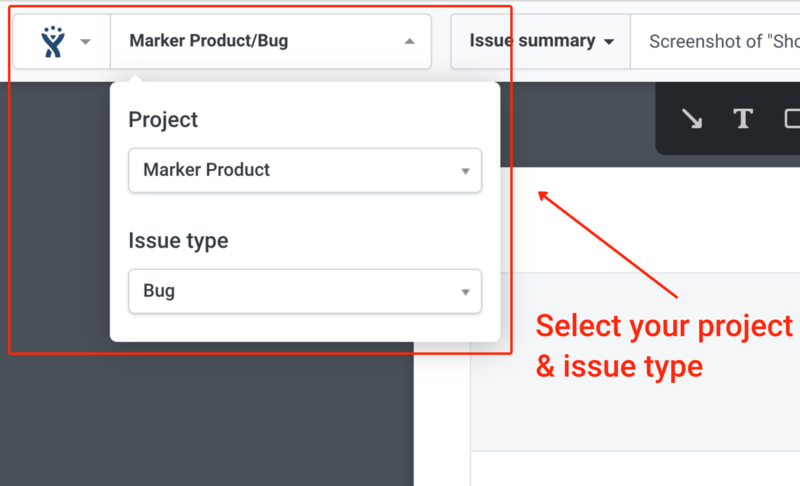 If you'd like to set up you own bug reporting & tracking workflow around Marker.io and JIRA follow these easy steps. Then, go to your Marker.io integration admin here and sync up your JIRA account. Now, it’s time to log some issues! Go to your website and start hunting for bugs. When you find one, click on the Marker.io browser extension and capture a screenshot. After capturing your screenshot, the Marker.io editor will open. In the upper left corner, select in which JIRA project and issue type you want to start sending bug reports. Marker will automatically remember the last Project and issue type you used for next time. Use the built-in annotation tools inside the Marker.io editor to get your point across. When you're done annotating your screen capture, make sure to document the actual and expected results of the bug. Some bugs might be obvious for you, but your developers won't always know what the final results should look like. Take the time to fill out the bug report template and your developers will thank you for it! 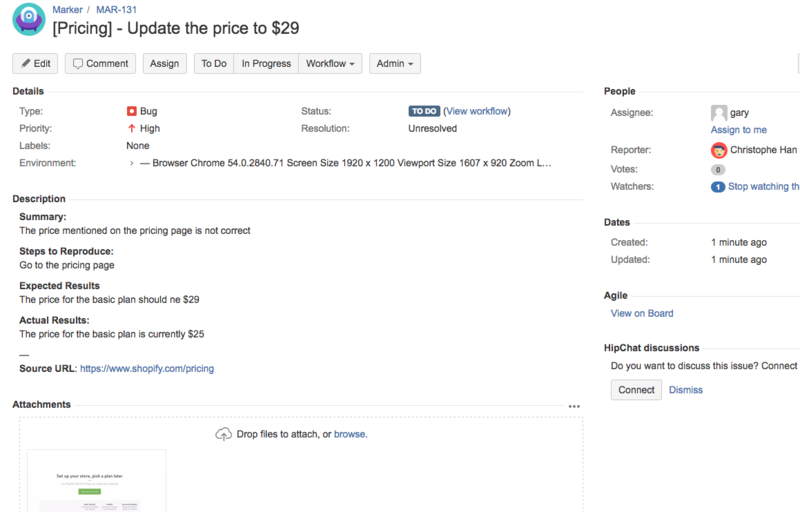 The description will be automatically converted using Markdown in a new JIRA issue. Consider adding a priority level to your bug report to make it manageable for your team to know on what they should work next. You can even add a team member. When you are ready, hit the big green button that reads "Create issue". Your screenshot will be converted into a JIRA issue in your selected project and all the information you included will be added to the issue as well. On top of all this information, Marker automatically grabs the technical information about your browser, OS and screen as well as the original Page URL. Your developers will now be able to easily reproduce the bug and they won't have to ask you again which browser you used or what is the size of your screen. The best part, you didn't have to do anything to. The issue is in the correct repository. The issue has a priority (using labels). Invite your team to collaborate in a dedicated JIRA project and roll out Marker.io to your entire team so anybody can report professional bugs and feedback in seconds without interrupting their workflow. Wait.... what about bug reporting on Mobile?